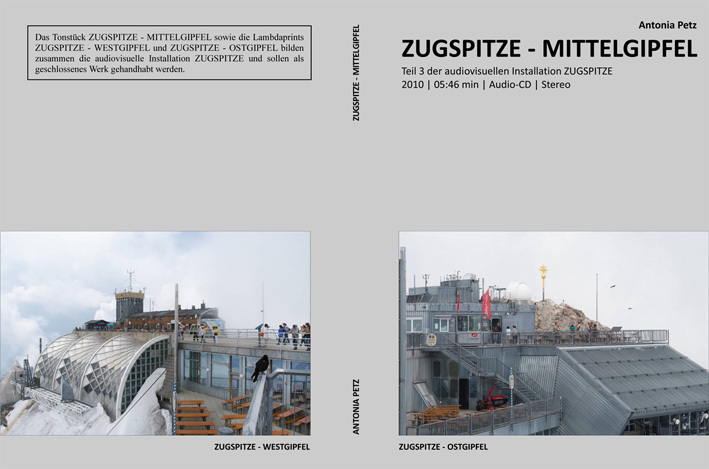 Ein audiovisueller Rundblick aus drei Teilen in 2962 Meter Seehöhe an der Grenze Österreich – Deutschland. (b1) It ends down there and then you have to go up with the cable car and then you get to the top. (b2) And what house is it there? (b1) That is the Münchner Haus. (b1) Yes, that is the Münchner Haus. (b2) I see, oh God! (f) No, no, we don’t go there, but we’ve … that’s about 10 meters … no, no, we see it well, the cross … well, we’ve been here, wait a sec, what time is it now? Half past two or what’s the time? … Half past two. We arrived, on the top we were at half past twelve, we were on the Zugspitz … Well, we went up with the cog railroad, yes and it’s great … and … well, now we went up with the cable car and then we’ll go down with it. Down to the Eibsee … ‘cause there’s the car. (b1) I have the place 1, but they’ll put us together, therefore I should come with you. But maybe we should wait for those two. (b3) It might still last! (b3) At least still one and a half or even two hours. (f) Yes, with the cable car … exactly, but … yes, but Dad that … yes, it’s a dream – the mountains are like a dream! Really, I’d rather not go back! … hahaha … yes, I am thinking of you … All right Dad, is Mum already there? (b1) This lady asked me: well, when are they coming? And I said: don’t you have a simpler question? How should I know that? I said: at 6 they leave Höllentalhütte. She said: we’ll keep it free until 6 pm. (b2) No, it shouldn’t be kept free, it’s been booked! (b1) No, no, they use your place! If you’re not there until 6 pm they allocate them anew! (b1) Yes! I’ve said so! (b3) We might go there and act as if we were all here – 5 people. (b1) No, no, no, no! They’ve asked me explicitly! Why five, there’re six registered? I say: one’s still coming! They looked at me so stupidly. (b4) One has fallen down. (f) Hello Mum! 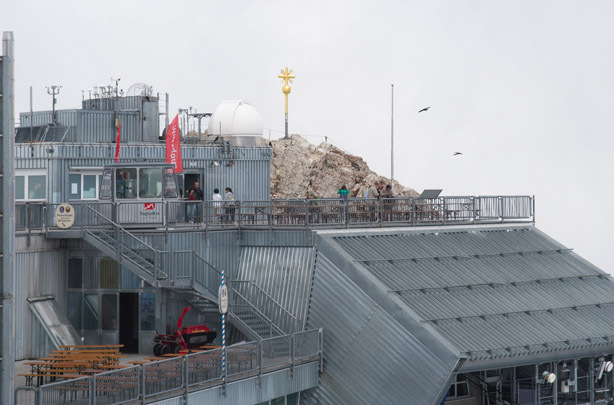 … Yes, we’re sitting on the Zugspitze … well. 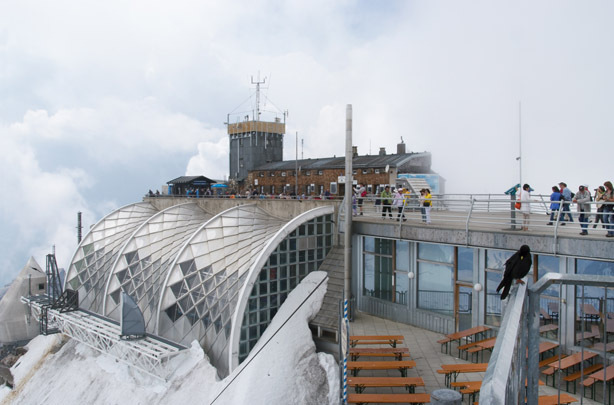 It’s cloudy, well the clouds are always moving, so you don’t have such a great panorama view, but they open from time to time. It’s delightful … yes … it’s really, really super … yes, hahaha…. (b3) The problem is, that there’re 60 or 40 places here. 40, right? (b3) these are the ones up there, with the small windows. (b1) Yes, I assume it, I assume. (b4) But let’s be realistic! It’s half past two now. Until 6 pm they are double as ( … unintelligible … ) they should easily manage it. (b1) No? Are they so far behind? Oh! (f) Yes, no, really! I’ve had it really … as we were going up in the cable car, I was thinking: oh, you’d like it so much … I know. I’ve never been here. Now I have finally been once … but it’s really fantastic and there’s hardly anything more beautiful than the mountains. Yes, that’s really like that … really true. Anyway, it’s really dreamlike! (b3) doesn’t matter in case of each ( … unintelligible … ) per every 100 meters in height they’ve made a break of almost twenty minutes. (f) And I just wanted to tell you, that we’re okay and we’re on the top and enjoy it … yes, with pleasure … always, always Mum … yes … yes, thank you … yes, thank you, we’ve already … yes back … Bye Mum … Bye … Bye … Bye … Bye. (f to m) Dad sends his love. (b) ( … ) sitting down or are you going on? (b) Hi, are you sitting down or are you going on? (b3) first we need to get places to sleep! (b) Well, will you take one for me as well? Yes! I‘m also staying here!